You often arrive home tired from a long and hectic day at work. Your neck and back ache from all the prolonged sitting and standing at work. What is the first thing you do? Flop into your sofa? Perhaps not. You light a candle first, right? From ancient gatherings to fancy dinner parties, high-end candles have been used across the world. But candles are not just beautiful sources of light. They can also significantly enhance your health and well-being. Here are six ways candles add that much-needed spark into your life. Aromatherapy is the practice of using scents to affect your mind and body. This practice comes with the knowledge that the human body is sensitive to the effects of different scents. Your brain’s chemistry changes when you are exposed to particular smells. For instance, if you are suffering from sleep issues, you can light up scented candles to have a good night’s sleep. Candles with the scent of chamomile are effective at reducing restlessness and anxiety. By focusing your attention on the candlelight an hour before going to bed, your eyes and the entire nervous system begin to relax. In turn, this allows for a restful and good night’s sleep. If you often work overtime, scented candles can help clear your mind and maintain focus. There is definitely no way for you to work at your desk for hours when you are feeling foggy. So it is important for you to clear your mind of any distractions. There is no better way of doing this than by enjoying the smell of a scented candle. Scents like cypress, thyme, and basil work well in work settings because they encourage deep thought and reflection. The ability to reduce stress is probably the most famous benefit of candles. People who enjoy meditating easily find inner peace when they choose to focus on candlelight. The light emitted by candles has a calming effect, which helps increase self-awareness as well as minimises stress. For an extra dose of relaxation, opt for lavender-scented candles. As you focus on the candle flame without blinking, tears will rush from your eyes. This helps cleanse your eyes, removing any blockages and dirt on each of your eyes’ surfaces. Moreover, focusing on the flame will help strengthen the muscles and nerves of your eyes. Errors of refraction can get rectified and your optic nerves become stronger. By performing this activity regularly, the eye strain caused by constant exposure to computer screens is eliminated. The regular practice of candlelight meditation helps keep your brain balanced and alert. Through this, your mind learns how to become unperturbed and calm. In turn, this helps greatly in improving memory. Moreover, by practicing this type of meditation each day, your willpower will get stronger. Did you also know that scented candles can help bring back one’s memory? Human beings usually associate different memories with scents that may have been used during a forgotten time. Scents are effective tools for any time you wish to take yourself back to a certain event or memory. Depression negatively affects the way you think, how you act, and how you feel. It causes feelings of sadness and a loss of interest in things once enjoyed. The good news is that it is treatable. One excellent way of erasing the feeling of depression is through candlelight meditation. The flame of the candle can soothe the mind as well as improve the supply of oxygen to the brain. 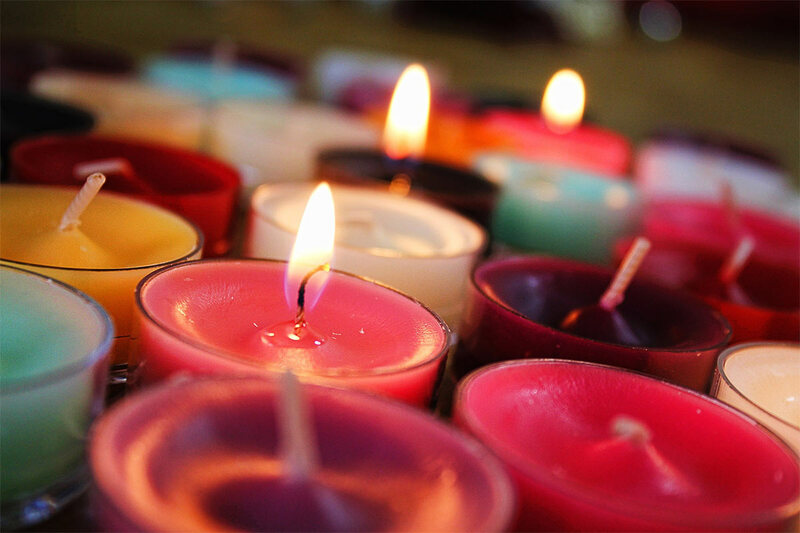 Whether you want to be relieved from the effects of a hectic, stressful day, or you wish to promote inner peace, the ways in which scented candles can boost your life are endless. You can make lighting candles a part of your daily ritual for you to bring balance, warmth, and joy into your world. When it comes to lighting candles, safety should also be prioritised. Never leave them unattended, and be aware of essential candle burning tips. When your work schedule doesn’t permit you to light a candle and enjoy it every time, do it whenever you are not busy. Mornings, evenings, vacations or weekends are all great times to work luxury candles into your life.